This architectural wall covering can be created in any color for a myriad of uses. Also available for tables, counter tops, accents and in patterned glass. 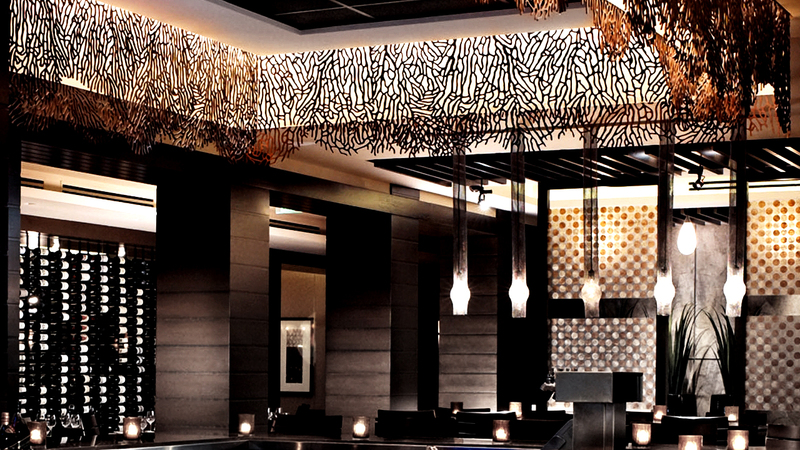 Laser cut wood patterns and panels can be used for dramatic lighting effects or additions. 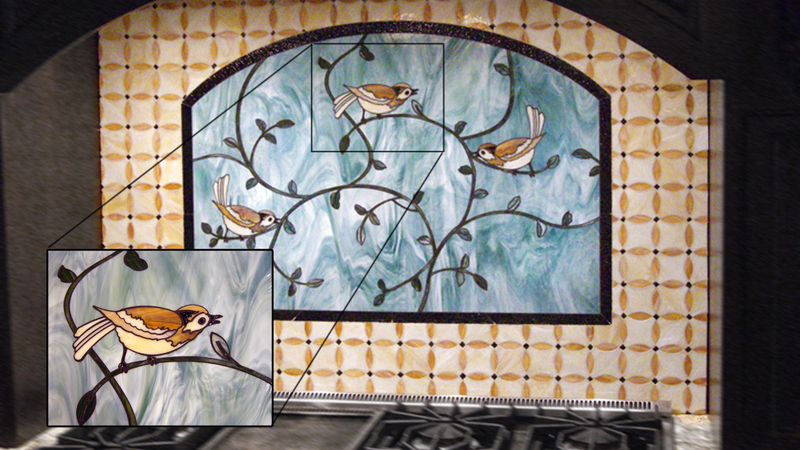 Custom combinations of imagery and patterns created in stained glass. 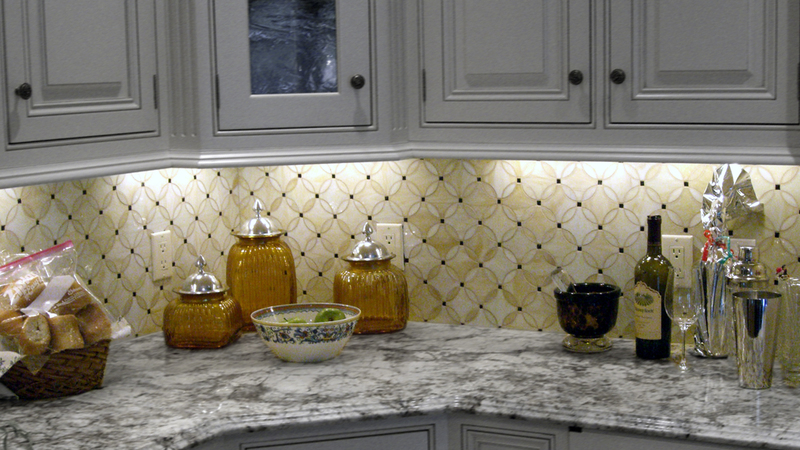 Elegant patterns and endless color combinations can compliment any decor. 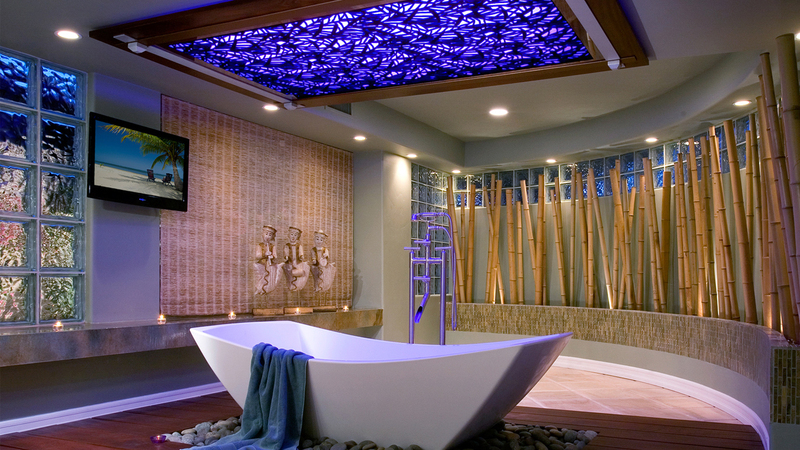 Exceptional and stylish applications of stained glass add dramatic additions to any space. 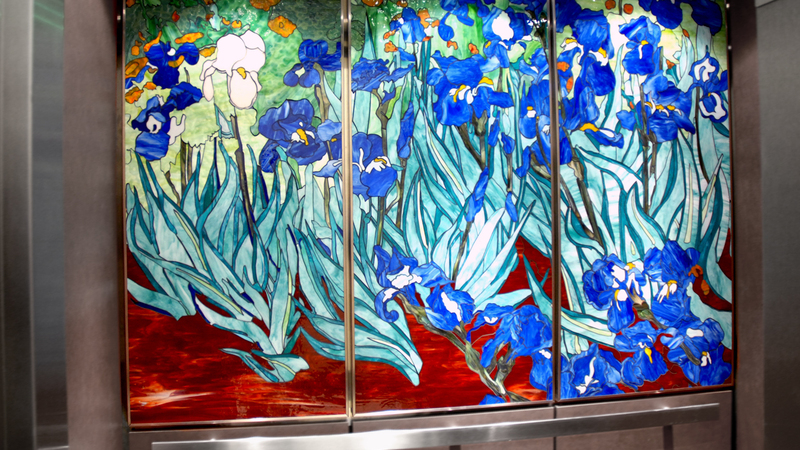 This elevator shows the many applications stained glass artwork can be incorporated into unique spaces. 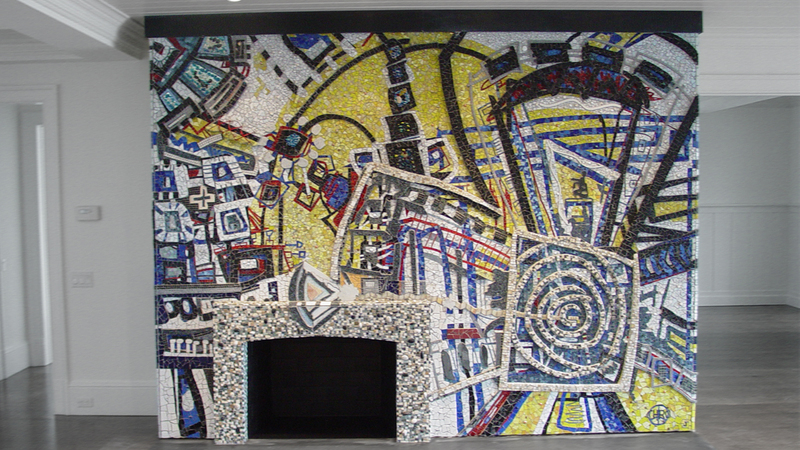 This combination of Glass, Stone, Marble and Metals was used to bring one of Rosie O'Donnell's paintings to life and personalize her family's space. 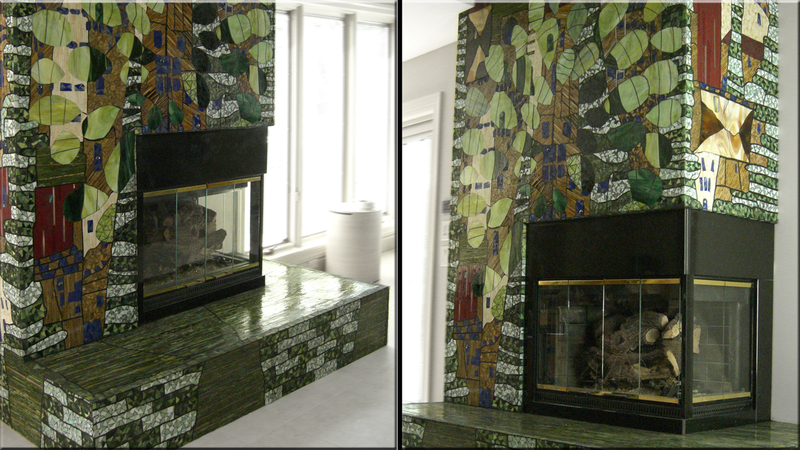 Inspired by a famous Hundterwasser painting, this fireplace surround was created in stained glass, marble and copper. 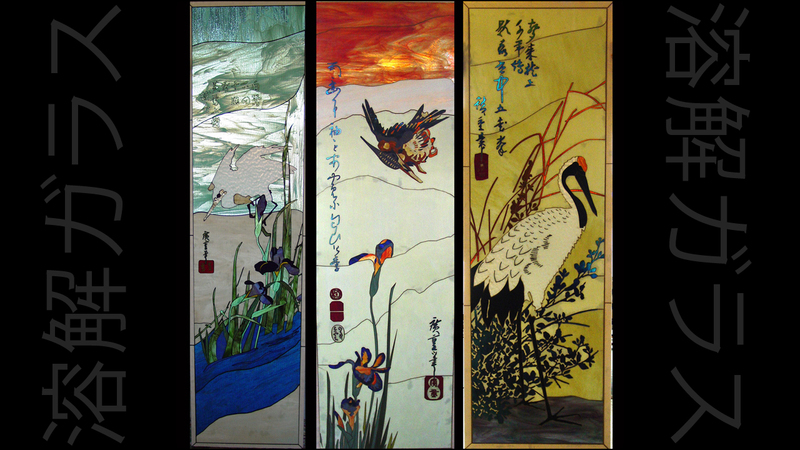 These three Fuzion® panels of five we produced for the United Nations were done using our patent pending stained glass technique. The pieces are recreations of Japanese Master Artist Hiroshige block prints and are 300-400% more detailed than is possible with traditional stained glass. 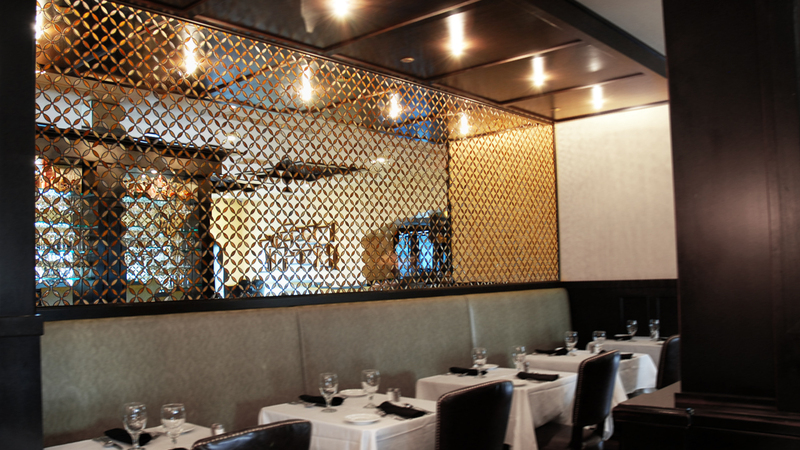 This wall covering was created using mirror and stained glass to add dimension, warmth and a distinguishing atmosphere to this restaurant. 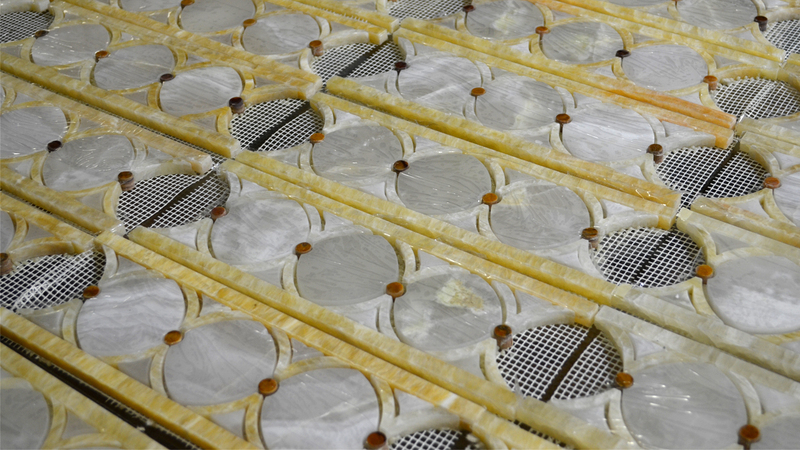 This image was taken during production of a water jet border created from White, Honey and Red/Gold Onyx. 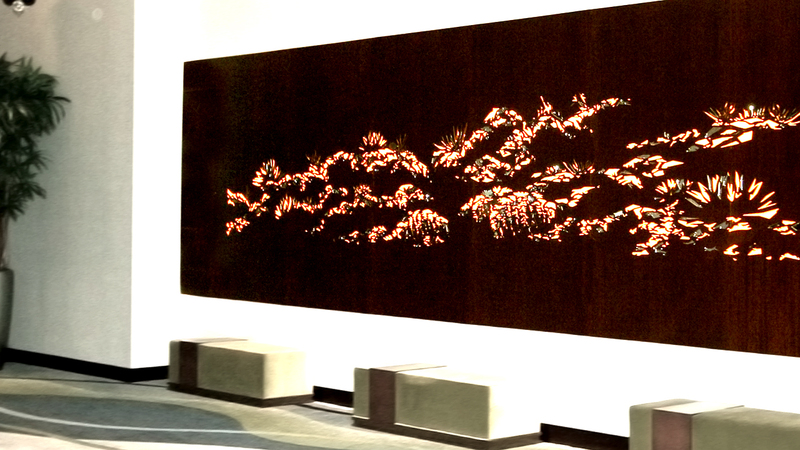 This large laser cut panel was created for a lobby and acts as an artistic focal point and lighting element. 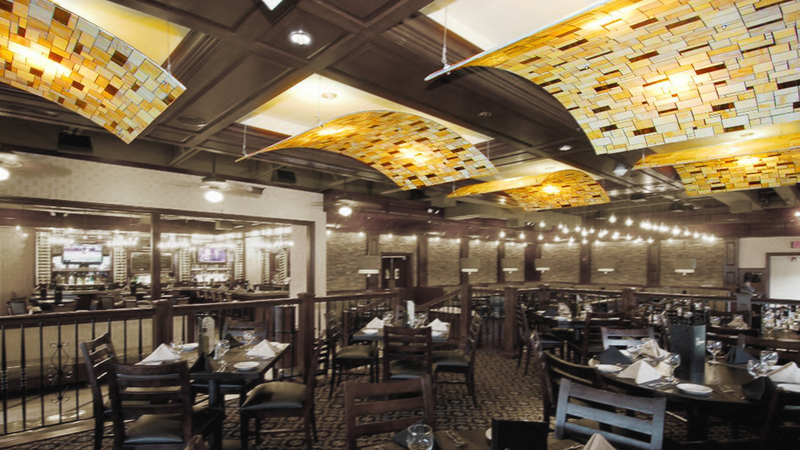 This laser cut wood soffit trim brings a dramatic addition with a more delicate design in both form and application. C² Resource Studio is a state of the art design and fabrication studio for the architectural and design communities. We offer a unique "incubator" environment where artists and artisans create almost anything imaginable for the most discerning of clients. 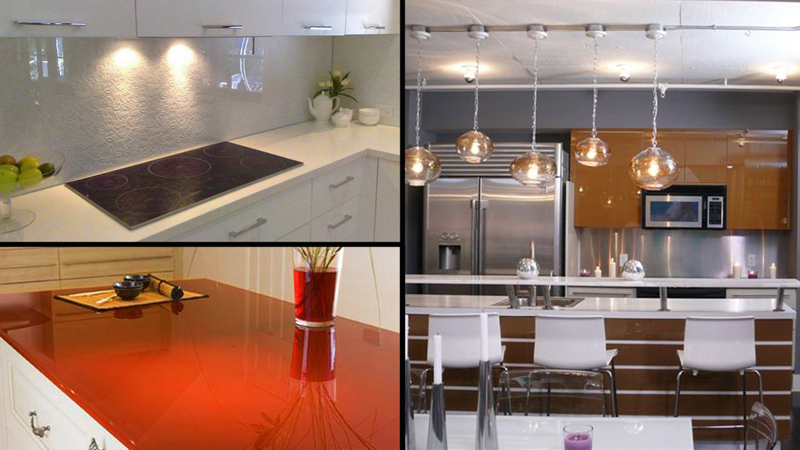 Interior and Exterior, Residential and Commercial, Elegant and Affordable, we supply it all. Attention to detail with an emphasis on quality and low ongoing maintenance puts C² in a class of its own. 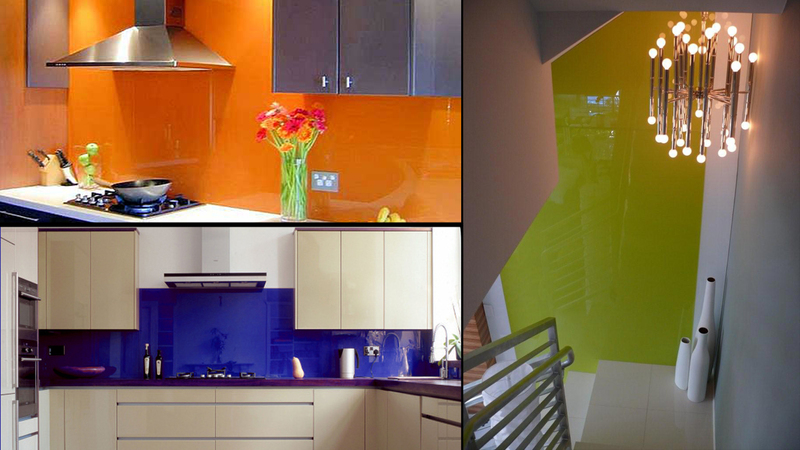 From glass to wood to stone, we specialize in back painted glass, custom murals and mosaics, wall coverings, and much more. With an in-house water jet and a dedicated team of designers, artists, and fabrication experts, we are capable to take on a wide range of projects and passionate about the ones we do. We have a long standing distinction, characterized by exceptional customer service, a quick turn around time, and quality products. chip@c2resource.com(Contact) owner Chip Hunter to see if we can be the resource for your next Custom Creation.